What’s new in the elementary school this summer? A kickball league! That’s right, our students are playing in a kickball league to work on their skills and to have some fun, of course. The idea was created and organized by Sarah Hurst, a lead behavior technician. Of all of the team sports there are, Hurst chose kickball for Vista students. She thought this through for a number of reasons. 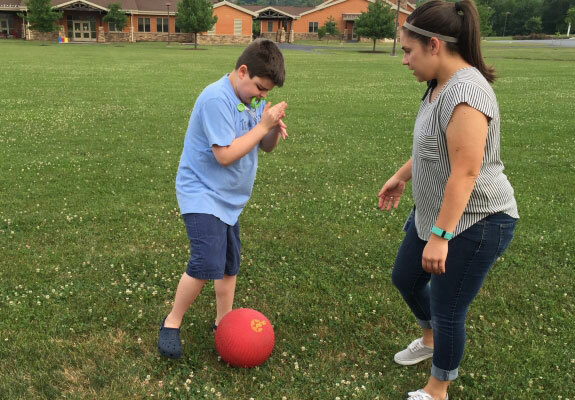 The kickball league helps students work on the goals in their Individualized Education Plans (IEPs). In addition, the lead behavior technicians (LBTs) in each classroom set specific targets (goals) for each student to reach. There are four teams in the league. Two teams in the younger classrooms play against each other, and two teams from the older classrooms play against each other. One game is held every Thursday of the Extended School Year (ESY) on Vista’s quad, but each classroom plays every other week. Not only are students participating in the kickball games, but during their weeks off, they also participate in a cooking activity to provide snacks for those playing in the games that week. “There is a menu for students to make a selection of which snack and drink they would like, while a student from the non-playing team fills out the order and exchanges the snacks. This gives students a chance to practice their communication and listening skills, peer interactions, and ordering from a menu,” Hurst said.